I am fairly new in the Game Used arena. 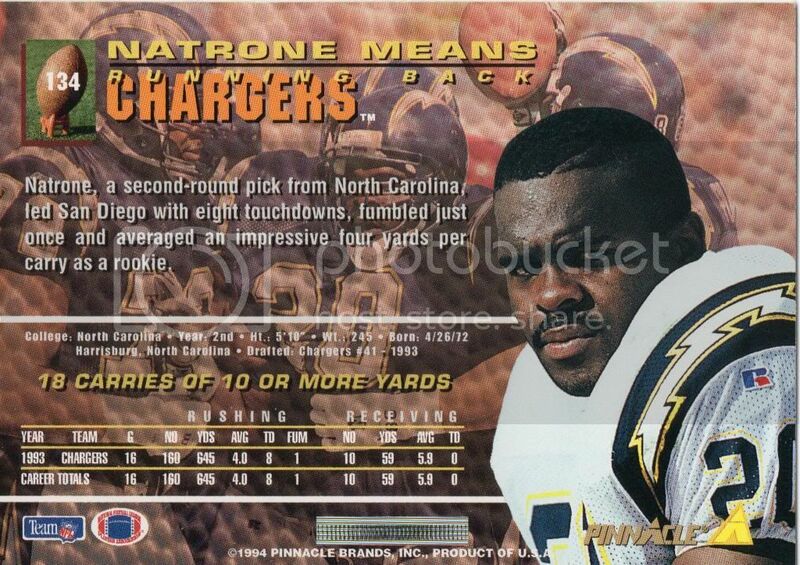 But I have been Collecting and a Chargers fan all my life (now 42). What kind of Jerseys, Helmets , Pants have you guys picked up over the years. Also what's your GRAIL that will never leave your collection? Nice to hear what you have, but guys are visual so TONS of Photos please! 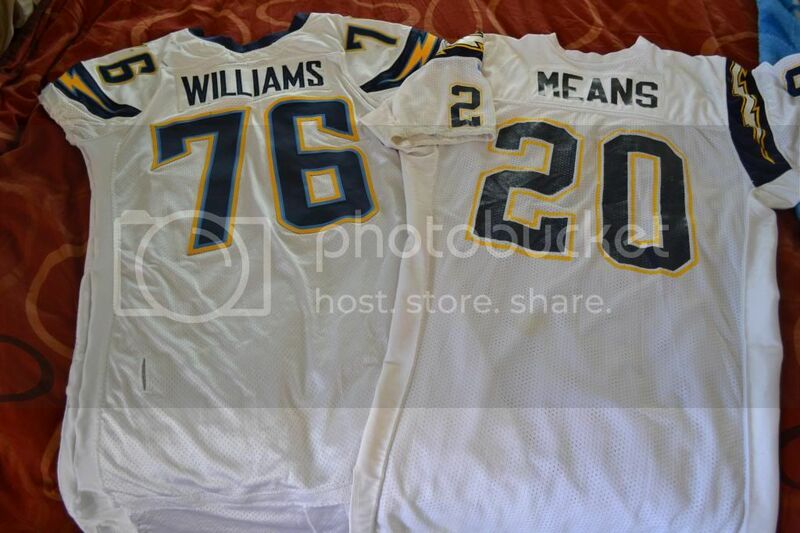 There are a couple of guys on here who have incredible Charger collections, they are the greatest jerseys in sports. 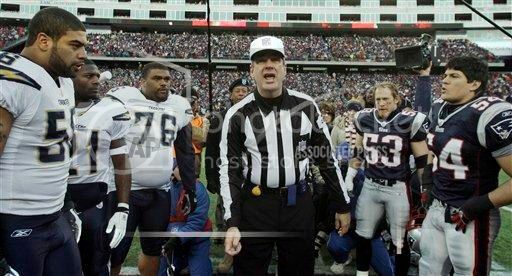 This is my LT white jersey photo matched to the first 5 weeks of the 2002 season. I got this from LT's teammate Tay Cody. Early in the 2002 season, the “T” in Tomlinson lined up with the left side of the “2” in 21 and the left side of the first “N” (TomliNson) lined up with the right side of the “2” in 21. The right side of the first “N” lined up with the left side of the “1” in 21. The left side of the last “N” (TomlinsoN) lined up with the right side of the top part of the “1” in 21; while the right side of the last “N” lined up with the right side of the bottom part of the “1” in 21. After week 6 vs Kansas City, the Chargers enlarged Tomlinson’s name plate. Beginning in the week 7 game at Oakland, the nameplate and the 21 now line up differently. The “T” now begins to the left of the “2” in 21 and the “N” ends to the right of the “1” in 21. The right side of the “2” in 21 now lines up with the right side of the “L” (TomLinson). Whoa!! Man I want an LT one day. Fantastic jersey. Thanks for sharing. Ill post some images in a few minutes. *The Jamal Williams is 2007 GU in second half of season and AFC Championship VS. New England Patriots. *1997 Stan Humphries & 1990 Ronnie Harmon. Show no use but currently assuming team issued. These came from the personal collection of Sid Brooks. *2000 Junior Seau Throwback Helmet. This was a gift to long time SF 49ers Publicist Dave Rahn. Seau gave this to him as a gift for helping him acquire 49er auto'd GU Jerseys donated for one of his Golf Tournaments. Shipped from Chargers Park to Dave. Not game used, but really cool. - What else you guys have? cmon I know there are some Chargers Fans in here...GO BOLTS!! I have a 1980's "gamer". Player identifiers have been removed. I particularly like the black "Chargers" sticker attached to the front bumper. Thanks for the compliment on my LT Jersey. I love your avatar, I'm a Bears fan/collector too. I got really lucky with this one back in 2003 before gamers took off on eBay. A Chargers collector emailed me the day I won it and offered me $1,000 more then I paid for it. He got stuck in SoCal traffic and didn't get home in time to bid before the auction ended. Thanks for the compliment, I hope you get your own LT one day.